There was a health fair this weekend here in Lynchburg. Seven families were shocked to find out that a loved one had a high blood sugar. Two kids and five adults now have a life-changing diagnosis. None of these people suspected they had a problem. How could this be? Typically, people associate diabetes with symptoms of drinking a lot and urinating a lot, but it can be a stealthy disease. Many can have high blood sugars for months or years before getting a diagnosis. And if that is not bad enough, high sugars damage your body, and that damage can be happening without you knowing about it. High blood sugars raise your risk for heart disease, heart attack, stroke, kidney disease, eye problems and blindness, cancer, Alzheimer’s and dementia. Not good! If your answer to even one of these questions is yes, then you should get checked. 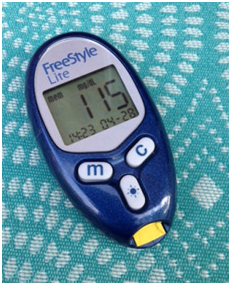 An easy test is a fingerstick blood sugar using a glucometer, a machine that measures blood sugars. You can buy a glucometer at any drugstore without a prescription, and they all come with a few test strips in the package. What do the blood tests mean? What tests can you ask your doctor for? Here is the good news: if your tests are not normal, there are many things you can do to bring your blood sugars down without medication! If you have abnormal tests, first start by talking with your doctor. If your blood sugar is very high, you may need medication immediately, even if just for a short time while you learn how to eat and exercise to get the sugars down. Eating lots of colorful, nonstarchy vegetables, proteins like meats, eggs, fish, poultry, and healthy fats like coconut oil, extra virgin olive oil, butter, ghee, avocado will keep you from being hungry and feeling deprived while greatly improving your blood sugars. Exercise is great to help bring down blood sugars and help your hormones work more effectively. Resistance exercises like weight lifting are especially helpful for those with blood sugar problems. Also important are cardio exercises, like walking, running, biking, and flexibility exercises: stretching, yoga, Pilates. Many vitamins and minerals work to help your hormones do their jobs. Magnesium, chromium, vitamin D, biotin, vanadium are just a few of these. Herbs like cinnamon, bitter melon, banaba, and gymnema are among the many used for centuries in other cultures to treat diabetes. Talk with your doctor or a knowledgeable practitioner about dosing and how to choose a high quality product. Just because they have no calories, does not mean they have no effect on your hormones or your metabolism. Stress, whether emotional (just have an argument with someone important? ), physical (joint pain, chronic headaches, and the like), poor dietary choices, lack of exercise all cause your adrenal glands to make a lot of cortisol. This is extremely important if there is a dangerous situation, because cortisol sends blood to your legs to help you escape, and raises your blood sugar so those muscles have energy to run. For most of us, though, we have stress – every day. High cortisol will keep your blood sugar high – every day! I use a saliva cortisol test to help figure out how well your adrenal glands are working, and guide my patients through a program on how to fix any problems we discover. Most adults need 7-8 hours/night to allow time for the body to repair. Do you get enough sleep? Do you sleep well? Do you feel rested and refreshed when you get up, or do you drag out of bed after hitting the snooze button a few times? Please read my recent blogpost on sleep for some tips if you have problems. It is so much better to discover if you have a problem with your blood sugar early, before it progresses into diabetes. But even if you already have diabetes, the best time to start making changes to your life is NOW! Many people have stopped some or all of their diabetes medications by changing their eating, exercise, stress, sleep.